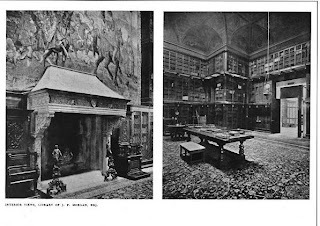 The Morgan Library built for J. Pierpont Morgan and designed by Charles F. McKim of McKim, Mead & White c. 1906 at 225 Madison Avenue in New York City. Originally built to house Morgan's personal library, the building was also the site of many of his business dealings. 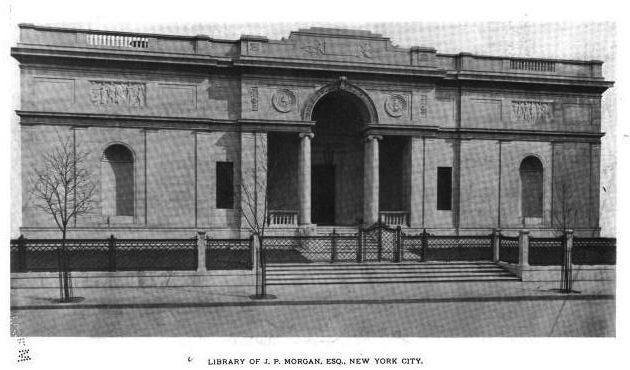 J.P. Morgan Jr. opened the library to the public in 1924. Click HERE for more on the Morgan Library and HERE to see the building, which has since been expanded by Renzo Piano, on google street view. Best of the best---so good it hurts (but hurts so good). By coincidence, I was on the Bowdoin College Campus a few days ago, specifically to take pictures of the Walker Art Building there for a post next week. Also by McKim, Mead & White, it is the design predecessor, smaller and simpler, no less superb, a decade earlier, of the Morgan design. 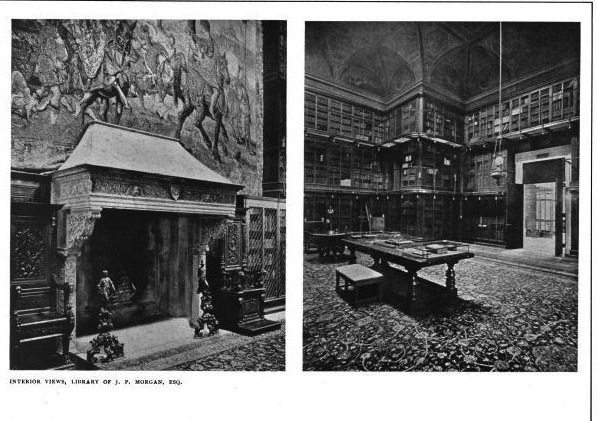 Design crush aside, I've also had recent occasion to need materials from the Morgan Library, and cannot say enough about how good and helpful the staff is in this sumptuous repository. Clearly the Morgan is more than just a pretty face. One cannot but compare the legacies of the two neighbors, Morgan and deLamar. This is perfection. Very few structures stand to its elegance, design, and exuberant interior halls. My God the marble. I love the elevation pictures and thankfully the firm created a book of their greatest buildings. Also the structure cost $2.5 million and is completely mortar less upping the price. The building went through several design phases initially Whitney Warren held this commission and honestly a very ugly baroque domed library would have been built. Its not known why he switched to Charles mckim but the initial design he had was of a Greek temple with slightly raised elevations but hey Morgan clearly knows his stuff and preferences. 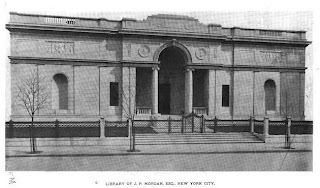 The Morgan is truly one of the finest small museums in the U.S. and it is housed in a wonderful collection of buildings, excluding the horrendously bland Renzo Piano glorified box which now leaches onto all original museum buildings. The JP Morgan Jr. house shows a great older 19th C. brownstone home, renovated with some beautiful interior spaces and updated for the Morgan family and the gloriously beautiful library, now fully restored after quite an accomplished restoration. Even the later library addition, built on Morgan seniors old home, completes what is a uniquely dignified, low scaled urban complex or oasis in the heart of Manhattan. If you have never been, you must go, no you must run to see the collections and the buildings themselves. Wonderful. The building cost 1.5 million, $50,000 of which was the additional cost of building the exterior walls w/o mortar -- though a 1/32 inch lead film was used between the blocks to account for the temperature difference between NYC and Athens. As for Warren, Morgan thought his proposal was unappealing, and begged off moving forward. 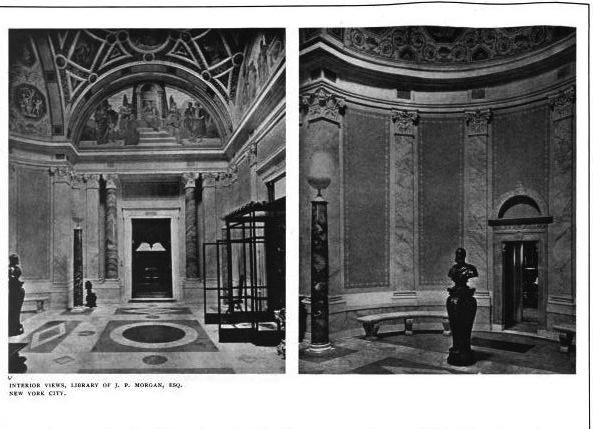 Two years later, he turned to McKim, with whom he was interacting on the topic of the new American Academy in Rome, and asked for a new proposal. McKim jumped at the opportunity, but being a gentleman, wrote to Warren, explaining the context. Just grand, thank you, spent a lovely evening poring over each of your links, and happily chasing after the various ones embedded within. That tapestry, the triumph of avarice indeed. That carpet, sublime [throwing the little scraps on my floors into tragic relief]. Going back now to see if I missed discussion on next year's expiration of the family's 100-year ban on being acquired by a parent organization, indeed whether I read that correctly at all. On viewing the glass-box construction attached to the beautifully classical Morgan buildings, a friend told me that it appeared to be an up-scale Home Depot Garden Shop. The addition would offend the souls of Pierpont Morgan, and his son, J. P. Morgan, if they but knew of the desecration. 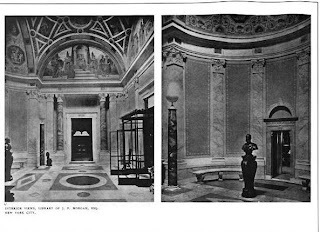 Fortunately for the Frick Collection the alterations and additions complement Henry Clay Frick's magnificent Carrere and Hastings-designed town house ! I don't think Pierpont and Jack Morgan were as sentimental as all that. Besides, who really think that Piano building will still be there in 60 years?